“What is an Appropriate Fee that a 401k Plan Should Pay?” (FiduciaryNews.com, August 6, 2013). It’s an answer everyone is searching for – and it just might surprise you. There comes a point when the costs of regulation exceed the benefits of regulation. This occurs when government insiders, industry powerhouses and various “friends” finally figure out how to make money on the regulatory framework. When that happens, it’s time to tear that framework down, hold a bunch o hearings, give the chance for some big name politicos and such to do the ol’ frog walk and start all over again. “Is It Time for Financial Planners to Advise Against 401k Plans?” (ThinkAdvisor, August 6, 2013) The usually reliable Bob Clark goes off the deep end by defending his use of DEMOS data in a recent column. Neither the recent column nor this one needs the DEMOS data to support its foundation. As this week’s lead story in FiduciaryNews.com gets (at the very bottom of the article, so have patience), there are better alternative retirement plans than 401k plans for smaller companies. While Clark is correct that regulatory costs increase the fees in 401k plans, it’s also true that regulatory costs increase the fees in mutual funds versus unregulated commingled assets. But, as the DOL says, with additional fees should come additional value. In other words, where’s a safer place to put your money – a (higher-cost) regulated mutual fund or a (lower-cost) unregulated fund? Remember, we’re not talking about any old rainy day savings account, we’re talking about your life savings. In other words, how much more are you willing to pay to better protect your retirement? “Prudential, MetLife Could Win Big Under Proposed Retirement Plan,” (Financial Advisor, August 7, 2013) Interesting idea here. The way to keep public pension plans is to turn over management to them to private companies. Of course, this has all the city and state comptrollers up in arms because they’d lose their power. Also, it shows you the power of the insurance lobby, since fiduciary advisers (i.e., RIAs) can and should be a part of this solution, too. “401k Industry Wants Tweaks To Illustration Rule Proposal,” (FinancialAdvisor, August 8, 2013) So the DOL, no doubt at the pestering of the insurance lobby, wants to know what people think about requiring retirement plan investors to convert their data in “an income stream.” This is a dangerous idea. Well, maybe not if you sell annuities. In that case it’s a tacit endorsement of your product by the government. But here’s why trying to standardize this type of calculation is dangerous – there are simply too many variables. The only way these calculators work with a professional by your side who can explain what the variables are and their impact. “SEC Pressured by Pols in IRS-Like Controversy: WSJ,” (ThinkAdvisor, August 8, 2013) This fear has been the 800 pound elephant in the room for some time. To have it come to light as a reality is shocking and intimidating to an industry already under fire for legitimate reasons. To add being on the wrong side of the political fence as yet another red flag – and perhaps a more damaging one – scares even the most compliant advisers – and further cheapens the credibility of regulators. The more we hear the less confident we become that anything good will come from this debate. Too many insiders have staked their claims to the loot that awaits them. That the loot belongs to everyday investors only confirms the hypocrisy inherent in the debate. “Judge got his facts wrong in 401k case,” (MarketWatch, August 5, 2013) This is about the John Hancock “non-fiduciary” case. The author implies it was the judge’s lack of knowledge of insurance products that led to a faulty “not-guilty” verdict. The greater point is, if plan sponsors are not using a fiduciary, then they’ve forfeited the right to sue for fiduciary breach. Of course, the same doesn’t apply to plan participants. They still have a fiduciary to sue – the plan sponsor. “Fiduciary Advisors Spend Less Time On Compliance,” (Financial Advisor, August 5, 2013) A new study debunks industry claims that moving brokers to the fiduciary model will increase their workload. But you already knew that. “Tourre Ruling Should Guide SEC in Fiduciary Rulemaking, Expert Says,” (ThinkAdvisor, August 5, 2013) By this he means, Tourre got nailed because he failed to disclose, meaning, like the John Hancock case of last week, disclosure is all you need when in a “suitability” based relationship. This, therefore, argues for a more rigorous definition of the fiduciary standard – one that goes beyond mere disclosure. “Senate Democrats urge delay in Labor fiduciary-duty rules,” (InvestmentNews, August 6, 2013) They can urge all they want, but unless they’re willing to change the laws the DOL is operating under, the DOL must continue to follow those laws. But if you try, sometimes, you can pay for what you get. “Fidelity Cleared of Excessive Fee Violation,” (PLANSPONSOR.com, August 5, 2013) Willie Sutton would have loved disclosure. He would have been allowed to rob all those banks if he had just disclosed upfront that he was robbing the bank. Oh, wait. He did disclose? Then how did he end up in jail? “Retirement attorneys say Yale prof’s 401k charges hot air,” (InvestmentNews, August 5, 2013) Courtesy of Fred Reish and a few of his fellow attorneys comes news that the infamous “Yale” letter (it’s not really from Yale) was based on shoddy research that wouldn’t stand up in court. “Not all 401k fees are equal,” (Employee Benefit Adviser, August 6, 2013) A good run down of what fees can be paid by the plan and what fees cannot be paid by the plan. “The real issue with 401k fees,” (BenefitsPro, August 8, 2013) Even if we had reliable benchmarks – which we don’t – 401k fees are just too subjective (given the differing value of associated services) to get a firm handle on. It’s happening. All around us. But you’ve got to be paying attention. Just because it’s August and most journalists are on vacation doesn’t mean news isn’t being made. But, hey, not to worry. It’ll be reported, eventually, say, sometime after Labor Day. Of course, by then, the damage will already have been done. “Just How Puzzling Are Annuities?” (ThinkAdvisor, July 29, 2013) References a good research paper that does a lot of explaining. Bottom-line: Annuities solve a problem, but not the main problem that is on everyone’s mind. “Guaranteed Income Is Top Priority for Retirement Plan Participants,” (ThinkAdvisor, August 2, 2013) Here’s the problem with surveys like this. In the pre-season, “Winning the Superbowl” is a top priority for nearly every single professional football player. Yet, come early February, only a handful of players can actually say they’ve fulfilled their priority. Guaranteed income is nice, but most retirement plan participants have nowhere near what they need saved in their account. “Mutual funds good enough for 401k plans,” (Employee Benefit News, August 6, 2013) Good article and a good overview of the advantages of mutual funds and the advantages – and disadvantages – of some popular alternatives. “Retirement Pros Weigh In on DOL’s Lifetime Income Plan,” (ThinkAdvisor, August 7, 2013) This is kind of ironic given the above article. That being said, you’ve heard of the expression “a solution in search of a problem”? The question of an annuity option in retirement plans is similar, but not quite the same as that. There is a problem – people desire a dependable source of income in retirement – but the primary solution isn’t an annuity, it’s merely the requirement to save more. It doesn’t matter how fancy an annuity you offer, if people haven’t saved enough, they’ve never generate enough consistent income during retirement. And that’s before you get into the entire controversy over whether annuities are the most prudent choice to deliver this “consistent” income. 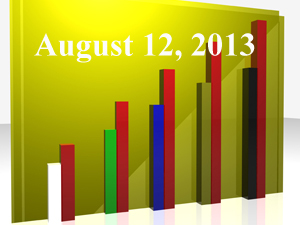 “Asset Allocation Funds See Q2 Losses,” (PLANSPONSOR.com, August 13, 2013) This is all about target date funds. Blame it on the bonds. But you already knew that. “Investors close to tapping their target dates clobbered,” (InvestmentNews, August 8, 2013) When you ride the bus, you don’t have the luxury of getting dropped off at your front door. You have to get off at the nearest stop. And sometimes the nearest stop isn’t too near. This article brings to mind two different issues. First, the coming bondocalypse is no longer coming – it’s here. Second, whenever you incorporate a one-size-fits-all solution in your investment philosophy, all you do is guarantee all those worst-case market scenarios will eventually hit you. Quite simply, if you’re nearing retirement, you’ve got to get off the bus. If you can’t afford to take another form of transportation, walk. Just get off the bus. Christopher, I can tell you from working for a large annuity provider that these vehicles are not the answer for 401(k)’s. These things are missrepresented with confusing reatures by wholesalers and brokers alike. Then, when the gurantees can’t be supported, they are reduced, cancelled changed, etc. What is the point of an annuity if there is no promise and integrity.